Elisa Vega Sillo, a member of Bolivia’s Vice Ministry of Decolonization, speaks about the unique work of the Vice Ministry, the role of historical memory in the country’s radical politics, and the importance of decolonizing Bolivia’s history of indigenous resistance. Shortly after the October 12th elections last year which granted President Evo Morales a third term in office with over 60 percent of the vote, I visited the government’s Vice Ministry of Decolonization. The Vice Ministry is the first of its kind and a center for the administration’s efforts to recover Bolivia from what is seen by much of the country’s indigenous majority as 500 years of colonialism, imperialism and capitalism since the arrival of the Spanish. The walls of the Vice Ministry’s offices were decorated with portraits of indigenous rebels Túpac Katari and Bartolina Sisa who fought against the colonial Spanish in 1781. 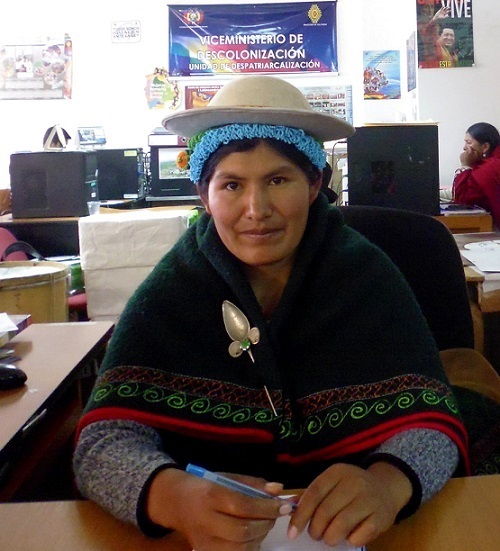 I sat down to talk with Elisa Vega Sillo, the current Director of the Depatriarchalization Unit in the Vice Ministry of Decolonization, a former leader in the Bartolina Sisa indigenous campesina women’s movement, and a member of the Kallawaya indigenous nation. 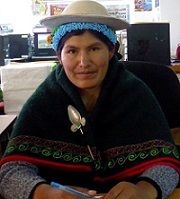 In the interview Vega spoke about the unique work of the Vice Ministry of Decolonization, the role of historical memory in the country’s radical politics, and the importance of decolonizing Bolivia’s history of indigenous resistance. Ben Dangl: Could you please describe the type of work you do here in the Vice Ministry of decolonization? Elisa Vega: We develop public policies against racism, against discrimination toward people with different abilities, the elderly, indigenous people. We also work on issues related to machismo and patriarchy. These are things we discuss and work on with young people, to help them question and raise awareness about these issues, because no one is questioning them… Another part of our work involves the issue of decolonization and the recuperation of our [indigenous] knowledge and skills. BD: What does decolonization mean politically and in everyday life to you? BD: Could you speak of the role of historical memory and how, as a Vice Ministry, you rescue pre-colonial history and knowledge, as well as myths and stories? EV: For the indigenous people this continues to be a part of our everyday lives. […] In our organizations, we speak a lot about colonialism, neoliberalism, imperialism. And we realized that it’s not [foreigners] that are oppressing the indigenous peoples, but now it’s a system that has been constructed, and we have accommodated this system. […] So we have to look behind us, but also ahead and ask ourselves ‘who are we and where do we want to go?’ These are the questions we raise in order to recuperate our identity. BD: Could you speak of the legacy and the history of Bartolina Sisa and Túpac Katari in this context, in terms of the work you do here in the Vice Ministry? EV: [T]his is something we work on and look at each day. Our questions have to be: Why were they sacrificed? Why were they struggling and what was it like? For us, you could say that Túpac Katari is like our grandmother, our mother. And it is the same with many of our past leaders – they are a part of our process of struggle. 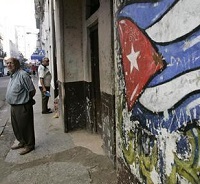 BD: How do you rescue an anti-colonial vision from history? How do you gain lessons, for example, from the histories of Katari and Sisa? EV: We try and recover an anti-colonial vision above all, because the [official] history that’s been recovered of Bartolina, of Túpac Katari was this: that the rebel indians were so bad, they laid siege to the…poor Spanish…the Indians are savage animals – this was the history they told us. But in reality [the indigenous people] rebelled to get rid of oppression, the slavery in the haciendas, the taking over of land, of our wealth in Cerro Rico in Potosi, our trees, our knowledge – they rebelled against all of this. But in the official history, the colonial history, they tell us that the bad ones were the indigenous people, and they deserved what they got. So we recuperate our own history, a history of how we were in constant rebellion and how they were never able to subdue us.